Revaluation of Tsarist Russia 1909-1917 stamps by overprinting stars and letters З.С.Ф.С.Р. (russian) T.S.F.S.R Transcaucasian Soviet Federative Socialist Republic. New post stamps issued by Azermarka in 2017 . Carpets.Published in 2017, new postage stamps are distinguished by their unique design and are devoted to one of the most vivid examples of folk art. As you know, handmade carpets of Azerbaijan are unique property of the people and differ not only in their variety, but also in rich colors and ornaments. 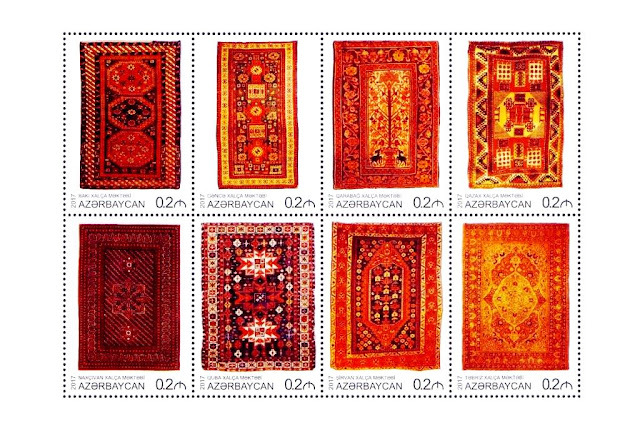 On the postage stamps of this issue there are images of various carpet weaving schools of Azerbaijan. Postal history of Azerbaijan: Air Mail (Airmail) According to the Azerbaijani news agency "AzadInform", the first flight of the mail plane on the territory of Azerbaijan was held in 1921 - 2 years before the start of passenger air traffic.This flight has made the veteran of aviation Arkady Romanovich Romanov on the first post-cargo aircraft in Baku. In June 1922 through Soviet territory had been laid second international avia magistral. The company "Junkers-Lyuftverner" started flights between Sweden-Persia through Moscow, Kharkov and Baku. Provides passenger and transit postal and cargo services. 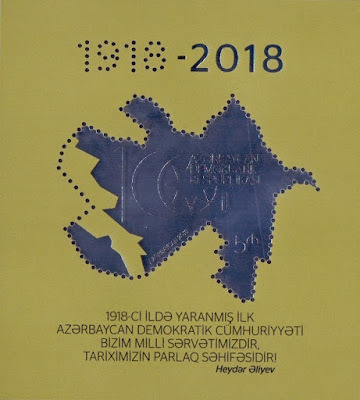 The next step in the history of air mail Azerbaijan is connected with the creation of "Azdobrolet" - a branch of the Russian JSC "Dobrolet". JSC "Azdobrolet" worked on a commercial basis and engaged in the carriage of passengers, mail and cargo. Charity Edition, Starving Volga. 1921. Stamps with an error - Space and Astronomy. Europe 2009.